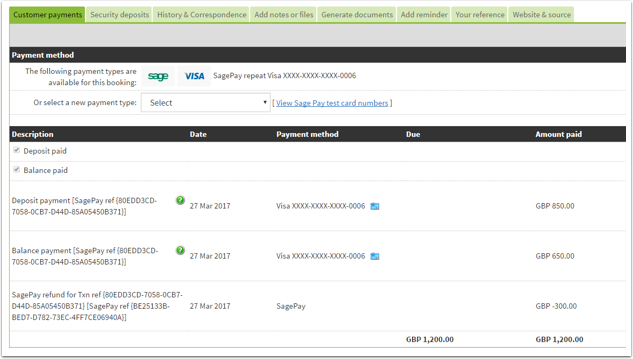 Help CentreUsing SuperControl Managing bookingsHow do I process a security deposit/refundable deposit? What is the difference between a Security deposit and Refundable deposit? A Security deposit is where you can “hold” the damage deposit by holding either a cheque or money on the guest's credit/debit card (dependent on your payment processor – this works with Sage Pay, Secure Trading and Holiday Rent Payment). You don’t physically take the money unless there are damages at the end of their stay. A Refundable deposit is where you include this money within the main deposit or balance payment of the booking. For example, if you take £500 refundable deposit, you would add this figure to your deposit/balance. The guest will pay this money to you and then you need to refund or retain the money depending on damages after the guest's stay. Note: Always be clear in your Terms and Conditions on how you retain and refund your damage deposits. How do I refund a refundable deposit? (Bank transfer, Cheque, Cash)? 1. Go to your chosen booking and scroll to the bottom of the page where it says “Enter custom payment”. How do I refund part of a refundable deposit? (Bank transfer, Cheque, Cash)? If your guest has caused damage and you wish to keep part of their refundable deposit to cover costs you can do this. 2. If refunding the full amount enter the full refundable deposit amount in the “Allocate to refundable deposit…” box. If you wish to refund an “Other” amount you can do this also, if not set this to zero. 4. If successful you will receive a “SUCCESS” message and this will now appear as a refund in your customer payments area. If an error occurs, this will clearly be displayed to you as well. 2. If refunding a part amount enter the refundable deposit amount you wish to take in the “Allocate to refundable deposit…” box. 3. Click “Pre-authorise card”. Once the page refreshes you can see that the money is Held. 2. Click “Take payment” and enter the amount you wish to take (you can enter in the full amount or part of the amount). Then click “Take payment”. We created a webinar on this topic, to watch it click here. 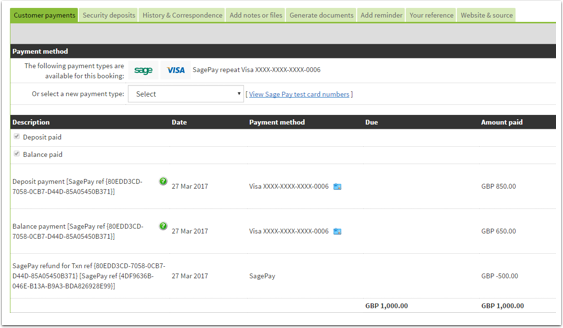 Prev: How can I take a payment in a booking with a credit/debit card? Next: How do I add notes to a booking?